The Breeding side of the industry just continues to expand and the reach of the Australian thoroughbred is untapped. We have a section of the site devoted entirely to Breeding aspects of racing. There are News articles, Briefs on studs, stallions, important siblings, upcoming Sales, Bloodstock companies and statistics available about all of them. On top of this we have both New Zealand and International sections specific for those markets. You can check out Sibling Reports and Stakes Race Results going back over a decade using the interactive databases on offer. 1. RESHUFFLES 3m M NEILSON 55.0kg (BUREAUCRACY (NZ) - SARA (AUS) (CANNY LAD (AUS))) JEREMY GASK then came 2. AADELAIDEE 2m (KELTRICE (AUS) - MAMA SAN (AUS)), 3. FOLLOW THE TILL 2m (GENERAL NEDIYM (AUS) - PRIMARY VISION (AUS)). 1. KEEP THE MESSAGE 2g J C COLLETT 56.0kg (KEEPER (AUS) - MISS MORRINSVILLE (NZ) (DESPERATE DEE (GB))) J RALPH then came 2. ELECTROSTATIC 2m (ELNADIM (USA) - ECHOSTATIC (NZ)), 3. FINALE 2g (STARK SOUTH (USA) - MCKLAIRLEY (NZ)). 1. SHANAMANN 8g L CROPP 55.0kg (MANNTARI (IRE) - SLEEPY SHAN (NZ) (SILVER DREAM (GB))) JENNY SCOTT then came 2. CAPE KINAVERAL 3g (CAPE CROSS (IRE) - RIGHTEOUS LADY (NZ)), 3. SHEREIGNS 5m (DANASINGA (AUS) - LILIACEOUS (NZ)). 1. GREAT NATION 4g P J HARVEY 54.5kg (KEY BUSINESS (AUS) - KEY STRATEGY (AUS) (MILITARY PLUME (NZ))) V A BROCKMAN then came 2. IMPRESSIVE STATS 5g (STATOBLEST (IRE) - FLORIQUE (AUS)), 3. GOBITON 4g (RUBITON (AUS) - GO LADY (AUS)). 1. SASSBEE 5g N RAWILLER 57.5kg (BLEVIC (AUS) - ANERET GOLD (AUS) (MARQUEE STAR (AUS))) DAVID JOLLY then came 2. SUPER ELEGANT 8g (MISTER C (USA) - EVER ELEGANT (AUS)), 3. ILLUSIONIST 4m (FAVORITE TRICK (USA) - MORNMOOT LADY (AUS)). 1. SMART AND MIGHTY 6g J BYRNE 56.0kg (BARYSHNIKOV (AUS) - BILLIE'S FLURRY (AUS) (PAG ASA (AUS))) TONY NOONAN then came 2. MITANNI 6g (DANEWIN (AUS) - AND A HUG (AUS)), 3. CONSULAR 9g (ROYAL ACADEMY (USA) - MISS PROSPECT (AUS)). 1. 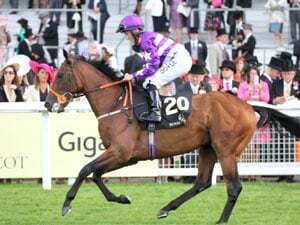 DON'T YA LOVETT 6g O P BOSSON 57.5kg (LORD BALLINA (AUS) - SEA HUNTRESS (NZ) (SOUND REASON (CAN))) A SHARROCK then came 2. FLOYDEBOY 6g (MELLIFONT (USA) - FLECHE D'OR (NZ)), 3. BULGINBAAH 5g (STARJO (NZ) - LADY TRISTIMUS (NZ)). 1. TAYASU RUN 3m S O'DONNELL 53.5kg (TAYASU TSUYOSHI (JPN) - MILLRUN (AUS) (BELELE (AUS))) BRUCE HYDE then came 2. KYELLDEE 3m (NOTHIN' LEICA DANE (AUS) - TWITCHING (AUS)), 3. FOR SHAME 3g (DR JOHNSON (USA) - SHAMEFUL (AUS)). 1. CAUSEWAY LASS 2m P ROBL 55.0kg (GIANT'S CAUSEWAY (USA) - CANNY LASS (AUS) (BLETCHINGLY (AUS))) PETER MOODY then came 2. AADELAIDEE 2m (KELTRICE (AUS) - MAMA SAN (AUS)), 3. AL ANOOD 2m (DANEHILL (USA) - ELJAZZI (IRE)). 1. AMAZING ME 2g O P BOSSON 56.0kg (DEPUTY GOVERNOR (USA) - RIVERLY LASS (NZ) (GLEAM MACHINE (USA))) BRENT GILLOVIC then came 2. SEVEN HILLS 2m (CITY ON A HILL (USA) - CIMAROSA (USA)), 3. JAZZELLA 2m (BLACK MINNALOUSHE (USA) - JAZZMATAZZ (NZ)). 1. ROCKING ON 5g J INNES 53.0kg (ZABEEL (NZ) - LAMBERT MISS (NZ) (DANZIG (USA))) MS G WATERHOUSE then came 2. GAZE ON 4g (INTERGAZE (AUS) - JOLEUR (AUS)), 3. VICTORY CHARM 5g (VICTORY NOTE (USA) - CHARM AND CHASE (AUS)). 1. FOR VALOUR 6g MS L MORRISON 54.5kg (BEAUTIFUL CROWN (USA) - QUICK GLANCE (AUS) (PALACE MUSI (AUS))) MITCHELL HUDSON then came 2. WORDS OF MAGIC 8g (MAGIC RING (IRE) - LOVE OF WORDS (AUS)), 3. DAN CITY 5g (CITIDANCER (IRE) - PHILOTIOUS (AUS)). 1. CONSULAR 9g S SCRIVEN 59.0kg (ROYAL ACADEMY (USA) - MISS PROSPECT (AUS) (RORY'S JESTER (AUS))) BILL BAKER then came 2. MITANNI 6g (DANEWIN (AUS) - AND A HUG (AUS)), 3. ROMARE 5m (MARSCAY (AUS) - ROSY CLOUDS (NZ)). 1. CHITABE 4g N CALLOW 55.5kg (PERUGINO (USA) - EDNA VALLEY (AUS) (RUBITON (AUS))) BRIAN MAYFIELD-SMITH then came 2. HADDLE MCDADDLE 4g (STRATEGIC (AUS) - IMPERIAL STAKAS (AUS)), 3. HILLSTON EXCHANGE 4g (MARWINA (AUS) - EVEN EXCHANGE (AUS)). 1. 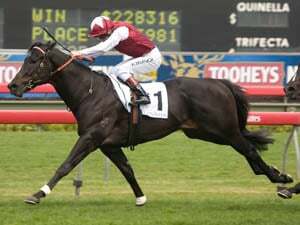 KIA ORA MISS 3m P FARRELL 55.0kg (JEUNE (GB) - PRECIOUS STONE (AUS) (AT TALAQ (USA))) ADAM DURRANT then came 2. KYELLDEE 3m (NOTHIN' LEICA DANE (AUS) - TWITCHING (AUS)), 3. BONNY DEE 3m (DR JOHNSON (USA) - IRISH MONARCH (AUS)). 1. KIM INVADER 4g T TURNER 55.5kg (SECOND EMPIRE (IRE) - KIM UMA (AUS) (UMATILLA (NZ))) M BURNETT then came 2. SPIDER STRIKES 6g (JACAMAR (IRE) - SNOW IN SUMMER (AUS)), 3. CLASSIC CHEVRON 5m (SPARTACUS (AUS) - OUR CANNY LASS (AUS)). 1. UMAPRINCE 4g JASON TAYLOR 52.0kg (UMATILLA (NZ) - INSTINCTIVE (AUS) (NATURALISM (NZ))) MICHEAL HICKS then came 2. CONSULAR 9g (ROYAL ACADEMY (USA) - MISS PROSPECT (AUS)), 3. MITANNI 6g (DANEWIN (AUS) - AND A HUG (AUS)). 1. EMPYREAL 6g C W JOHNSON 56.5kg (HIS ROYAL HIGHNESS (NZ) - DIPHDA (NZ) (BELDALE LEAR (USA))) P L MCKENZIE then came 2. SPHENOPHYTA 5g (GROOM DANCER (USA) - BALLERMOSS (NZ)), 3. COLD START 7g (BISCAY WONDER (AUS) - BALMERINO MISS (AUS)). 1. BRAVE LANCER 5g J BOWMAN 54.5kg (BAHHARE (USA) - FINE TALK (NZ) (LORD BALLINA (AUS))) NEVILLE MCBURNEY then came 2. VERB 6g (ZABEEL (NZ) - DARRA PRINCESS (AUS)), 3. DANEBAR 6g (DANEHILL DANCER (IRE) - MIAMBER (AUS)). 1. 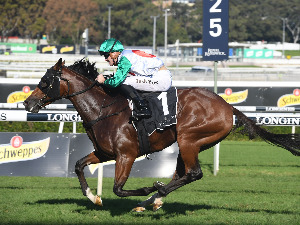 WITH A CHANCE 4g G BUCKLEY 54.5kg (COMMANDS (AUS) - CAREER COLLECTION (AUS) (SNIPPETS (AUS))) LUKE GRIFFITH then came 2. MR UBIQUITOUS 5g (TALE OF THE CAT (USA) - ZAHRA (NZ)), 3. HIT THE ROAD 4g (WATERFORD ROAD (AUS) - LIAR LIAR (AUS)).